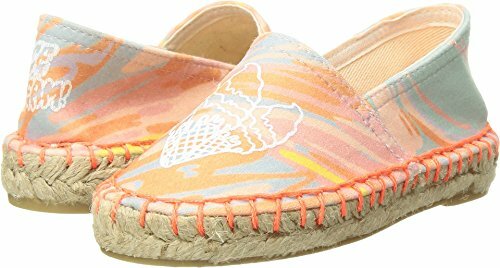 She'll love her look wearing these Stella McCartney Kids™ Rae Marble Print Espadrilles. Synthetic upper with marble ice cream print. Round toe flat. Slip-on construction. Synthetic lining and insole. Jute rope midsole. Synthetic outsole. Imported. This item may ship with an attached security tag. Merchandise returned without the original security tag attached or a damaged tag may not qualify for a refund. Measurements: Weight: 3.8 oz Product measurements were taken using size 25 (US 8.5 Toddler), width M. Please note that measurements may vary by size. Weight of footwear is based on a single item, not a pair. She'll love her look wearing these Stella McCartney Kids™ Rae Marble Print Espadrilles. Synthetic upper with marble ice cream print. Synthetic lining and insole. Jute rope midsole. Synthetic outsole. Imported. This item may ship with an attached security tag. Merchandise returned without the original security tag attached or a damaged tag may not qualify for a refund. Measurements: Weight: 3.8 oz Product measurements were taken using size 25 (US 8.5 Toddler), width M. Please note that measurements may vary by size. Weight of footwear is based on a single item, not a pair. If you have any questions about this product by Stella McCartney Kids, contact us by completing and submitting the form below. If you are looking for a specif part number, please include it with your message.